Exploring the ideas of Sustainability in The Built Environment; exploring current issues and a vision for the future. Is building with glass sustainable? I have recently joined London Sustainability Exchange (LSx), as a Project Volunteer and have been tasked to write a monthly ‘Sustainability in Architecture’ article to be included in the LSx news bulletin. For my first article I chose the subject of glass and briefly assessed the rapid development of glass skyscrapers in the City of London. The recent development of iconic, entirely glazed skyscrapers changing the London sky line, including The Shard, The Cheese Grater and The Walkie Talkie, prompt the LSx to question how sustainable is building with glass? Glass is a high energy, high cost material and as the construction sector develops towards transitioning to a more efficient design and building process we question is there still space for glazed buildings? The recent discussions led by architect Ken Shuttleworth and Arup engineers about whether the glass sky scraper is a thing of the past prompt the LSx to review the rapid development of glass skyscrapers in London, and wonder what the future holds for London’s landmarks. In the 1920s Mies Van Der Rohes Glass sky scraper concept defied laws of materials and was a vision of a technological future. The Ideology of glass depicted then was of simplicity and ultimate modernism. Ninety years on we continue to heavily use glass, especially in iconic London landmarks. Despite glass being expensive and high in manufacturing energy it is still seen as modern and is vastly used in building today. In the current environmental context, the construction sector should be developing and using new innovative materials as an alternative to glass, that have a positive impact on our environment and society; materials that lay the foundation for a sustainable future. Manufacturing glass is a high energy process and it requires extremely high temperatures. 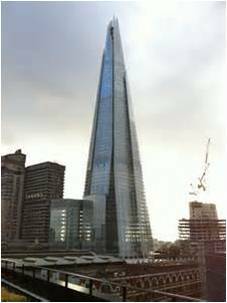 The energy used to produce glass for the entire facade of the Shard for example was on a tremendous scale. The shards white glazing means that the transparency of the building is a prominent feature however; the internal appearance appears messy and disorganised, drastically affecting its crystal shard like appearance. Furthermore, due to the particular white glazing used, the solar gains are vastly increased and require complex internal environment control. However, The Shards glazing system is passive and is coated with a colourless solar-control coating, Ipasol made by Interpane and an integrated solar blind system claims to reduce solar gain by 95%. Fundamentally, glass lets a lot of heat in and out. The preventive method to reduce solar gains and heat loss in glazed buildings is a tremendous feat of engineering and design. The Leadenhall building nicknamed The Cheesegrater, similar to The Shard, has a technical three tiered glazing system with integrated solar blinds. Despite being a very clever and innovative solution to overheating, from an environmental and economical viewpoint, it may have been better to design efficiency into the building rather than having to expend time, money and energy to mitigate the negative impacts on internal environment caused by glazed curtain walling. Architects are fixated on glazed facades; planners desire glazing and the public enjoy the iconic stylised designs. In order to achieve efficiency in building and develop toward a sustainable built environment glazing needs to be reduced. The integration of sustainable design and modern architecture is long over due. So it is amazing to see innovate architecture that has sustainability rooted within the scheme and the design process. The crystal by Wilkinson Eyre is a great example of the future of sustainable architecture as it is a scheme that realises stand out modern architecture can be efficient and that sustainable design doesn’t hinder creative flair but it can increase it. Sofie Pelsmakers however disagrees in her review of the build in On Office magazine, her last paragraph states that the design is unlikely to become a prototype of sustainable urban design due to its inability to adapt to different contexts and its high cost of £4000/sqm. She goes on to say that it might give the impression that this is what sustainable building is all about, when more efficient buildings on a lower budget can be delivered. I however feel that the point of this building has been missed throughout the report, and that it is in fact exactly what the current sustainable climate in architecture needs- A stand out piece that shouts to architects who fear sustainability with a cry of you can still produce modern architecture and be sustainable too. It may be drastically expensive but today architects need inspiration to adapt and integrate sustainable design into their work and practise, I personally feel this design is a breath of fresh air and although not a model for the future it is a huge stepping stone into and efficient beautifully design built environment. Sustainability and beauty combined in architecture.